The Battle of Inchon (Korean: 인천 상륙 작전, Hanja: 仁川上陸作戰, Incheon Sangnyuk Jakjeon; code name: Operation Arthur) was an amphibious invasion and battle of the Korean War that resulted in a decisive victory and strategic reversal in favor of the United Nations (UN). The battle began on September 15, 1950, and ended around September 17. Through a surprise amphibious assault far from the Pusan Perimeter that UN and South Korean forces were desperately defending, Incheon was secured. The battle ended a string of victories by the invading North Korean People's Army (NKPA). The subsequent UN recapture of nearby Seoul severed the NKPA's supply lines, placing North Korean forces in South Korea in a dangerously untenable situation. As the invasion fleet neared, UN cruisers and destroyers closed on Inchon to clear mines from the Flying Fish Channel and to shell NKPA positions on Wolmi-do Island in Inchon harbor. Though these actions caused the North Koreans to believe than an invasion was coming, the commander at Wolmi-do assured the NKPA command that he could repulse any attack. 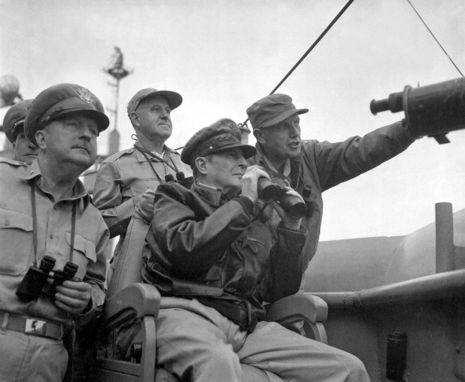 On the morning of September 15, 1950, the invasion fleet, led by Normandy and Leyte Gulf veteran Admiral Arthur Dewey Struble, moved into position. 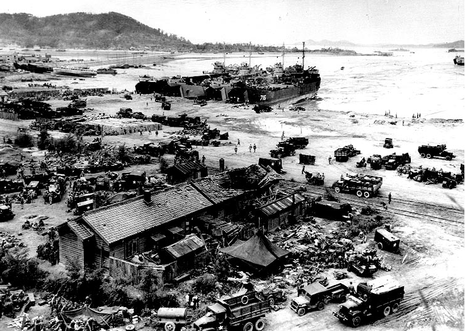 Around 6:30 AM, the first UN troops, led by the 3rd Battalion, 5th Marines came ashore at "Green Beach" on Wolmi-do. Supported by nine tanks from the 1st Tank Battalion, the Marines succeeded in capturing the island by noon, suffering only 14 casualties in the process. Through the afternoon they defended the causeway to Inchon proper, while awaiting reinforcements. Due to the extreme tides in the harbor, the second wave did not arrive until 5:30 PM. At 5:31, the first Marines landed and scaled the sea wall at "Red Beach." Located just north of the Wolmi-do causeway, the Marines on Red Beach quickly reduced the NKPA opposition, allowing forces from Green Beach to enter the battle.